Talk about craft beer for long enough and eventually the awkward issue of cost rears its ugly head. Craft beer is, almost by definition, pricier than mainstream (‘craftless’?) beer, for a number of reasons. Firstly, the components are undeniably more expensive; a 6% hop explosion clearly needs more raw ingredients than an insipid, 3.5% hop-free pint. Secondly, there are economies of scale – while there are exceptions, most craft beer comes from small breweries who inevitably have higher per-unit costs than big national or multi-national brewers. Of course, when it comes to Monster Beers, high strength beer duty comes into the equation as well. And yet, all these factors can’t really justify a 330ml bottle of beer costing £10. On a ml for ml basis, I would actually be better off just buying a bottle of whisky rather than this bottle of beer, and obviously the alcohol duty on 330ml of whisky is way more than that of beer. So what else are we paying for? The name? The exclusivity? Or (and I suspect this is the real answer) the fact that we’re willing to pay it? It’s not, after all, the first time that beer has been sold to us as “reassuringly expensive” – although, does that imply that Stella Artois was, in fact, the 80’s craft beer?! A tenner is well above my normal beer-buying threshold, but two factors draw me in. Firstly, Caol Ila is one of my favourite distilleries and my curiosity is piqued. Secondly, Summer Wines is one of those breweries that have a solid reputation for producing interesting beers and I’ve been meaning to try something of theirs for a very long time. Kopikat Caol Ila is a true monster, at a huge 9.4% ABV and has been aged for six months in a barrel which had previously held a 1983 Caol Ila. 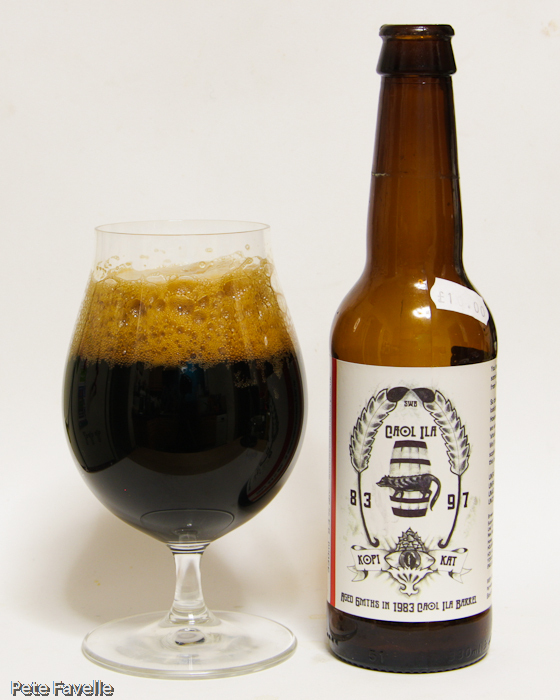 It pours incredibly thickly, looking more like black treacle than beer and with a substantial, dark brown head on top. The nose is rich and sweet, burnt toffee, a touch of espresso and the slightest alcohol. There is just a suggestion of oak from the barrel, but no real evidence of its whisky heritage. In the mouth it’s phenomenally powerful – a huge alcohol punch battling with bitter burnt sugar. As those calm down, a little sweetness comes through, along with just a hint of soft, dark fruit. Despite the thick nature of the pour, in the mouth it’s light and foamy, more like drinking a mousse than a beer and bizarrely at odds with the heavyweight nature of the flavours. The finish is long, with a tannic bitterness and a stickiness that is far more substantial than the actual sweetness on the tongue. There’s definitely a whisky-like raw undercurrent, which adds to the power to the taste – but it’s brash and unrefined and, to be honest, could be any old dram. The longer it sits in the glass, the more pronounced the whisky dimension becomes however it remains clumsy and somehow detached from the beer itself. It’s a big, powerful beer but I’m not entirely convinced by it; each component is present and correct, but it lacks the balance that you need to hold all the powerful flavours together. It’s nice, but sufficiently flawed that I can only really give it 2 stars – and definitely not worth the spectacular price.